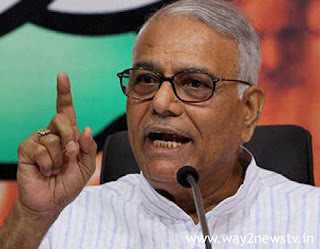 Former Finance Minister Yashwant Sinha said, "If the BJP is not out of the party, then the Modi government can win him out of the party. He said that the Prime Minister was trying to meet Modi on public issues but did not get an appointment. Prime Minister Narendra Modi did not come at least for countless letters he wrote. For these reasons, he said that he had to set up a platform called 'statement'. He said the NDA surgeon was not working to fulfill the election promises ... He said the state government was aimed at putting pressure on the central government to ensure the assurance given to the NDA government in Manifesto. In this regard, he said that the party was expelled from the party on charges of contradiction.